How much do Blue Jays suites cost? Prices typically range from $5,000 - $7,000 for Toronto Blue Jays suites. Prices vary based on day of game, opponent, and the location of the suite in Rogers Centre. 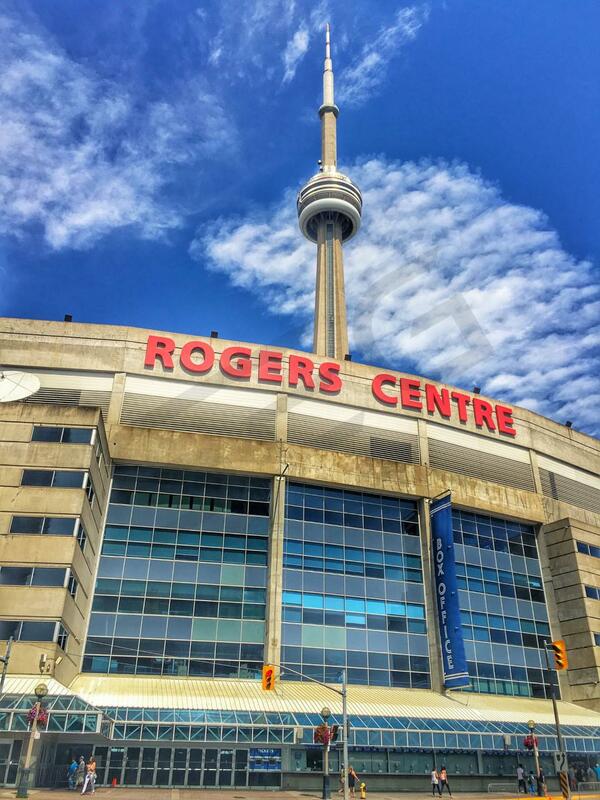 Luxury suite prices for concerts and other events at Rogers Centre can vary widely based on the type of event. These Blue Jays suites are located on the 300 level at the Rogers Centre. They include 18 tickets. Luxury boxes feature interior and exterior seating, private restroom, HD-TV and a dedicated suite attendant. These Blue Jays suites are located on the 400 level at the Rogers Centre. They include 12 tickets. Luxury boxes feature interior and exterior seating, private restroom, HD-TV and a dedicated suite attendant. The youth movement is evident for the 2019 Toronto Blue Jays. The Blue Jays feature arguably the number one prospect in all of baseball, Vladimir Guerrero Jr. Guerrero is just one of many future stars for the Jays that fans can see in 2019. Bo Bichette and Danny Jansen are two other names to keep an eye on. To lead Blue Jays back to the top of the AL Central, the Jays hired new manager, Charlie Montoyo. The lineup that Montoyo will be putting together daily will feature Lourdes Gurriel Jr., Justin Smoak, Randal Grichuk, Kevin Pillar and Kendrys Morales. Noticeably missing from last season are Troy Tulowitzki and Russell Martin who both left via free agency. The pitching staff is hoping for a bounce back season from Marcus Stroman and Aaron Sanchez. Both Stroman and Sanchez have shown Cy Young talent in previous years. Clayton Richard and Matt Shoemaker will round off the Jays’ rotation. Rogers Centre luxury boxes in Toronto feature first-class amenities such as HDTVs, private restrooms, premium seating extended from the suite, and a dedicated Blue Jays suite attendant. A Blue Jays suite will accommodate groups of 12 – 18 guests. In-suite catering options are available to purchase in advance. With your suite, you will get private entry into the Rogers Centre and exclusive access to stadium clubs. For business, a Blue Jays skybox is a great place to hold a meeting or briefing prior to first pitch. For friends and family, guests can enjoy the intimate setting of a Rogers Centre suite as a group. 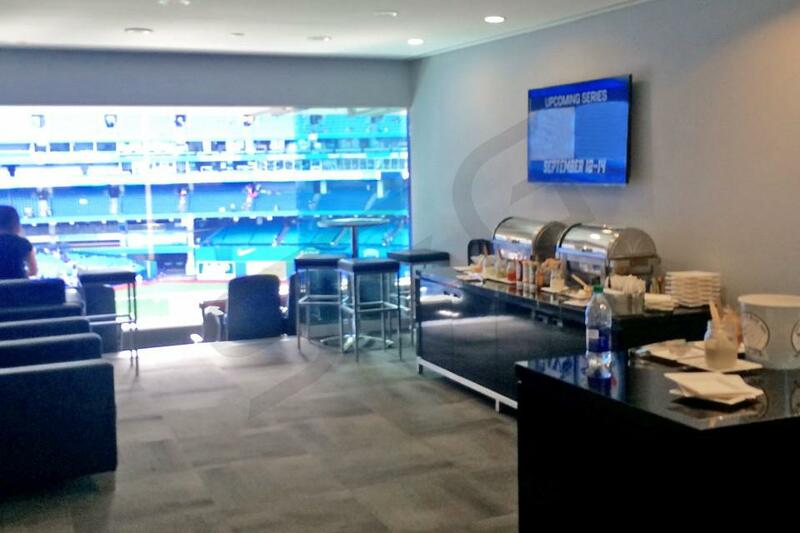 Regardless of the purpose for your visit, Rogers Centre luxury suites offer an unforgettable experience. The Toronto Blue Jays enter 2018 as one of the more intriguing teams in Major League Baseball. If healthy and playing well, Toronto has a legitimate shot to compete for a playoff spot in the American League. After declining Jose Bautista’s mutual option, the Blue Jays will enter 2018 without their former power hitting right fielder for the first time in a decade. Manager John Gibbons will look to lead the Blue Jays to their third postseason appearance in his six years since returning as manager to Toronto. In the off-season general manager Ross Atkins acquired Aledmys Diaz and Yangervis Solarte to shore up the team’s depth in the infield. Middle infielders Troy Tulowitzki and Devon Travis struggled to stay healthy last year, providing the need for more depth up the middle. First baseman Justin Smoak, who enjoyed a career year and All-Star appearance in 2017, will look to replicate last season’s success. Similarly, defensive wizard Kevin Pillar expects to match last year’s production both at the plate and in center field. Of course, the entire lineup relies on the production of perennial MVP candidate Josh Donaldson, who won the MVP award in 2015 for the American League. Throw in veteran catcher Russell Martin and designated hitter Kendrys Morales, and the Blue Jays still have an extremely potent offense when healthy, despite the loss of Bautista. On the mound, the pitching staff revolves around Long Island native Marcus Stroman. Stroman is among the league’s crop of talented young fireballers, and he is one of the most entertaining personalities in all of Major League Baseball. When healthy, Aaron Sanchez also has the potential to be one of the best young pitchers in the MLB. He will look to regain his 2016 form, in which he won 15 games with a 3.00 ERA. Veterans Marco Estrada and J.A. Happ look to solidify the starting rotation behind Stroman and Sanchez. The 2017 Toronto Blue Jays look to continue the team’s recent success. After losing in the ALCS in 2016, the Blue Jays will do their best to get back into the postseason. The Blue Jays have made some additions in the offseason but the most notable move maybe the veteran they didn’t resign, Edwin Encarnacion. Encarnacion has signed with the Cleveland Indians. The Blues Jays did bring back Jose Bautista however. Bautista’s supporting outfield cast includes Kevin Pillar, Steve Pearce, Melvin Upton Jr. and Ezequiel Carrera. The infield will be the same as fans got to see at the end of 2016. Russell Martin is behind the plate, Justin Smoak will man first base, Devon Travis at second, Troy Tulowitzki at shortstop and Josh Donaldson at third. The Blue Jays infield has the potential to lead the league in home runs. Health is always a question with some of their guys such as Travis and Tulowitzki. To help replace the loss of Encarnacion, The Jays signed Kendrys Morales. The Blue Jays hope to make some big strides in the starting rotation this season. Aaron Sanchez was fantastic last year and will be the ace of the staff in 2017. Marcus Stroman is another young player with top of the rotation skills. The rest of the staff includes J.A. Happ, Marco Estrada and Francisco Liriano. Closing out games this year is going to be Roberto Osuna. Rogers Centre luxury boxes feature first-class amenities such as HDTVs, private restrooms, premium seating extended from the suite and a dedicated Blue Jays suite attendant. A Blue Jays suite will accommodate groups of 12 – 18 guests. In-suite catering options are available to purchase in advance. With your suite, you will get private entry into the Rogers Centre and exclusive access to stadium clubs. For business, a Blue Jays suite is a great place to hold a meeting or briefing prior to first pitch. For friends and family, guests can enjoy the intimate setting of a Rogers Centre suite as a group. Offense: The 2016 Toronto Blue Jays are the defending American League East Division champions. A year ago, they clinched a playoff berth for the first time since 1993. After losing in the ALCS, the Blue Jays didn’t make many moves in the offseason. The most notable change is they did not re-sign David Price. Still, manager John Gibbons knows he has one of the league’s best lineups. The Blue Jays will get a full year out of Troy Tulowitzki who came over in a trade last season. American League MVP, Josh Donaldson will defend his honor. Donaldson hit .297, 41 home runs and drove in 123 RBI last season. Jose Bautista and Edwin Encarnacion are two of baseball’s premier hitters. Donaldson, Bautista and Encarnacion all have the power to hit over 40 home runs this year. Russell Martin is as durable as they come for catchers. Devon Travis had a fantastic rookie year until getting hurt. Once he’s back in the lineup, he’ll provide above average power for a second baseman. Kevin Pillar proved to be one of the best defensive outfielders in all of baseball. Pitching: The biggest offseason transaction was the signing of Drew Storen. Storen will step in right away and be the Blue Jays’ closer. Roberto Osuna filled the role nicely last year but Storen will add veteran leadership to the bullpen. Marcus Stroman bounced back from an early injury last year and finished the year very strong. Stroman will be replacing Price as the ace of this staff. The rest of the rotation will feature R.A. Dickey, Marco Estrada, J.A. Happ and Drew Hutchison. While they lack depth in starting pitching, they should have one of the league’s strongest bullpens. Schedule: In 2016 the Blue Jays will host the Arizona Diamondbacks, Cleveland Indians, Kansas City Royals, Detroit Tigers, Seattle Mariners, San Diego Padres, Baltimore Orioles, Tampa Bay Rays, Houston Astros, Los Angeles Angels of Anaheim, Minnesota Twins, Boston Red Sox and the New York Yankees. Suites: Whether you will be attending a game for business or pleasure, Blue Jays luxury suites at the Rogers Centre can accommodate any occasion. Blue Jays luxury boxes offer premium in-suite catering options, interior and exterior seating, private restrooms, HD-TVs and a dedicated suite attendant. 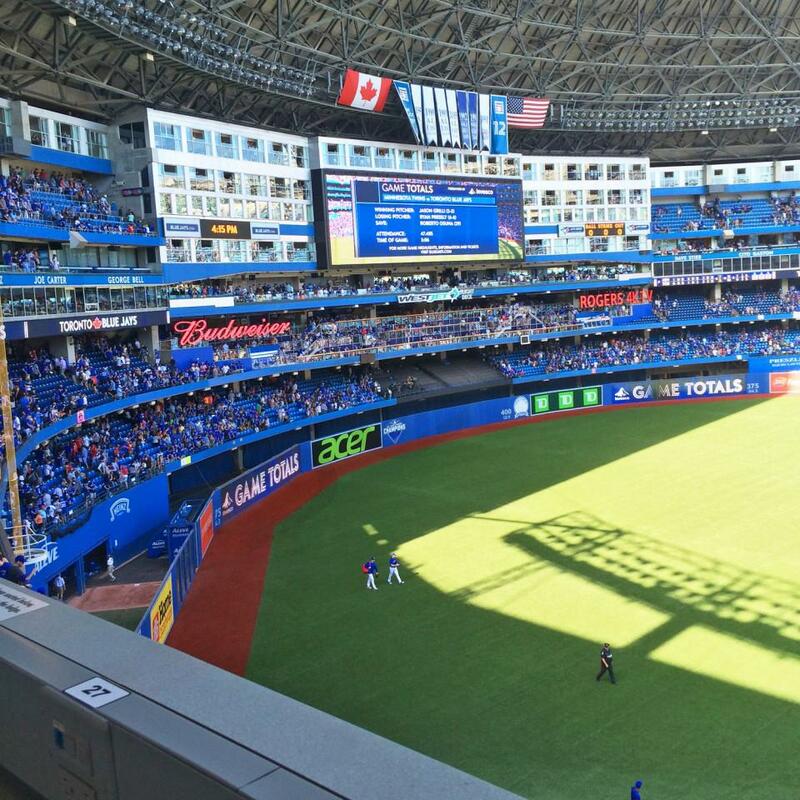 Experience Blue Jays baseball in VIP style with a suite at the Rogers Centre. After finishing third in the American League East in 2014, the Toronto Blue Jays went out in the offseason and added to premier position players. They traded for Josh Donaldson with the Oakland A’s and signed catcher Russell Martin. These players will join other Blue Jays stars such as Jose Reyes, Jose Bautista and Edwin Encarnacion. On the mound, R.A. Dickey and Mark Buehrle will lead their pitching staff. Marcus Stroman proved he’s ready to pitch every fifth day after a solid rookie season. The Blue Jays will look to get back into the postseason for the first time since 1993, the longest drought in baseball. The Blue Jays will enter 2015 with one of the most feared lineups with Reyes, Bautista, Donaldson and Encarnacion. Whether you will be attending a game for business or pleasure, Blue Jays luxury suites at the Rogers Centre can accommodate any occasion. Blue Jays luxury boxes offer premium in-suite catering options, interior and exterior seating, private restrooms, HD-TVs and a dedicated suite attendant. 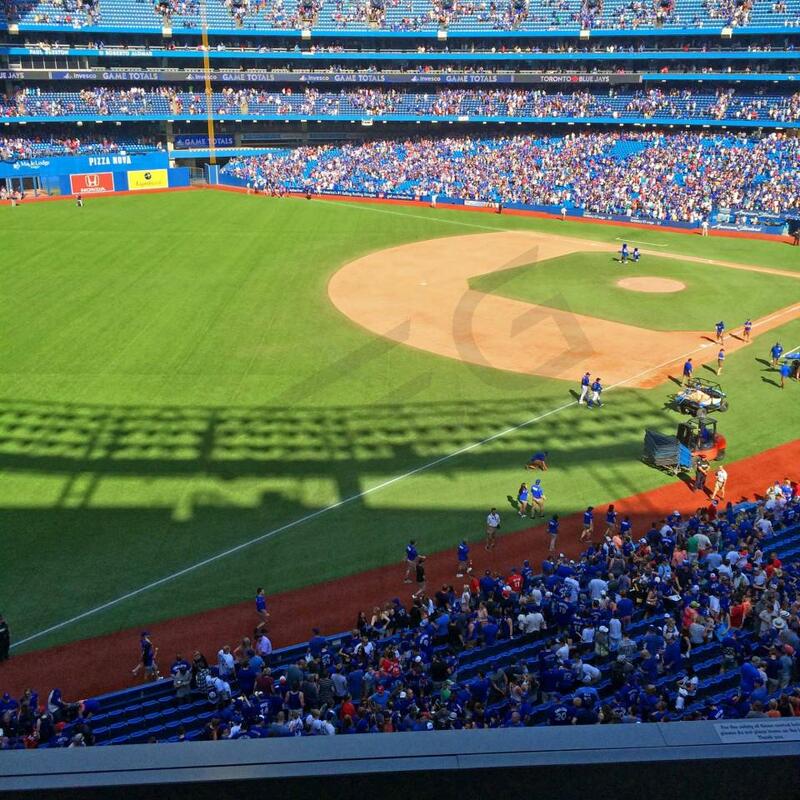 Experience Blue Jays baseball in VIP style with a suite at the Rogers Centre. Thank you for signing up for specials at Rogers Centre. Enter your email address below to stay in touch. We'll sign you up for our newsletter, which will inform you of the latest inventory and events at Rogers Centre. We promise we will never sell or distribute your information. The seating chart below shows where the Toronto Blue Jays suites at Rogers Centre are located.